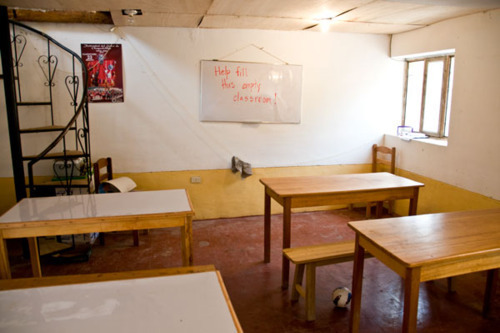 Help fill this empty classroom by teaching women to teach! Awamaki needs your help to launch a new women’s cooperative that can change the lives of local women! By providing them with intensive training, Awamaki hopes to offer single mothers and impoverished women in Ollantaytambo the opportunity to become Spanish teachers. Because our town does not currently have a Spanish language institute, women trained by Awamaki have a fantastic opportunity to earn an income potentially five times higher than minimum wage, thus gaining better access to schools for their children, health care, and nutritious food. We have volunteers, tourists and service-learning groups who need Spanish classes. We just need your help getting started. What do you say? Can you help us? If you donate on October 19th, Global Giving will match 30% of all online donations, with an added $1,000 bonus to the project that receives the most funds that day. So make your gift count for even more by saving the date, then clicking on this GlobalGivinglink to donate $10, $25, or more! Over the next week and a half, we will be blogging in more detail about this program and the women whose lives it will benefit, so stayed tuned! Thank you for helping us to improve well-being and change lives in rural Peru.